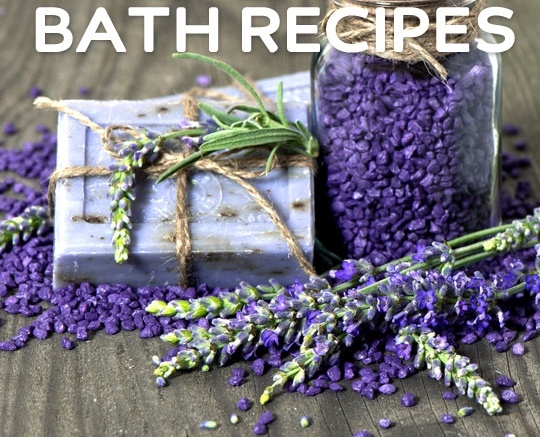 Easy DIY Bath Recipes are perfect to clean, relax, rejuvenate and detox you. You can use aromatherapy to help relax the mind and detox you by helping to release toxic thought patterns or you could add 12 surprising things to your bath. For example there are healing properties linked to adding Jello to your bath… adding tea… or even honey. 2. Add honey to your bath in order to smoothen your skin and detox. 3. Add Jell-O to uplift your mood and hydrate your skin. 4. Add milk to your bath for sunburn relief. 5. Add oil for it’s anti-aging properties. 6. Add salt for relaxation and pain relief. 7. Oatmeal acts as an excellent, all-natural skin softening addition to your bath. 9. Lemon Recipe is refreshing in hot weather. Squeeze and drop 5-6 lemons into your running bath. If you don’t have lemons, 3/4 cup of bottled lemon juice will work just as well. Soak & relax. 10. Ginger Bath Recipe- Add one tablespoon of fresh, chopped ginger to your running bath. Soak & relax. 11. Baking Soda Bath Recipe- Add 4-5 tablespoons of baking soda to your running bath. Mix baking soda with salts or milk for added benefits! Soak & relax. 12. Cinnamon Bath Recipe for spiritual purification. – Cinnamon sticks are more convenient, but powder will work just as well. Drop 3-4 sticks of cinnamon into your running bath. If you don’t have sticks, place ¼ cup of ground cinnamon in a cheesecloth and drop it into your bath.